90% of the time I have my phone plugged into the Boom USB inside the fairing of my 17 RGU. For the times I have it mounted on my handlebars, I would like to know the best way to run a cord to the handlebars from the Boom USB and still keeping the plug inside the fairing available for when I keep my phone in there. I appreciate any ideas. Ciro Premium Mount for constant power to phone then use Bluetooth for the streaming. 1) Decide on your mounting choice, many options are available. 2) Decide if you want the USB to phone connection to be from the Boom USB port of separate. 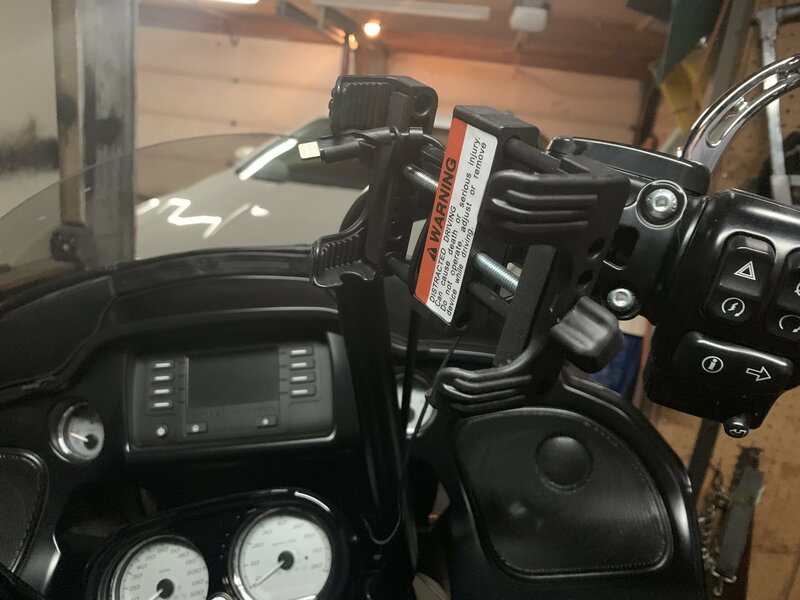 2a) If you want to connect via the Boom USB port run a cable out of the glove box, across the inside of the fairing and route to the mounting choice. You can plug in the mount USB cable when it's being used and swap to the direct connect cable when you stash the phone. Alternately you can use a small USB splitter and keep both plugs connected. I've use this method for having different USB media thumb drives but not to connect a phone. 2b) If you want an independent USB charging port, you can connect the port adapter into power in the fairing. Choices are mounts that include a power to USB port or a specific power to USB cable. The final connection is a USB to phone cable. Regardless of your mounting and power choices: If you are routing the power cable where it will stay on the bike all the time, ie through the fairing and zip tied to the handlebars, I suggest getting an endcap for the plug. That way when the plug is not in the phone it's covered from the elements. I replaced 3 USB to iPhone cables (slow learner I guess) before I found the caps to put on the cables. If the cables are routed through the fairing this is a hassle for sure. For additional power on my 2015 FLHTK I added the accessory cables to use one of the switches on the dash. I connected a 2 wire quick disconnect cable from the accessory adapter into the fairing and then used the 2 wire to USB adapter. This is the same type of 2 wire cabling used for the battery tender and by using the adapter I can easily replace it if fails. Originally, I had routed power to USB port motorcycle specific kit but it shorted out and I didn't want to re-do wiring again. Search Amazon for "motorcycle usb power outlet" and you'll get more ideas than you can shake a stick at. I have a kinda of a permanent wire zip tied to my brake line up to my handlebar mount. When Not in use, I cover it with a screwdriver bit holder. (Cover is not on in the photo, but you can get an Idea from it. Thanks for all your suggestions . It's nice to have options and ideas that are proven to work by those who have experience with them. What phone holder are you using?